ELMA System is provided both in commercial (Express, Standard, Enterprise) and free (Community) editions. The system editions have different system features, supported DBMS and Windows features. Each system edition can be installed using a separate software installation media. It is provided after signing a licensing agreement. 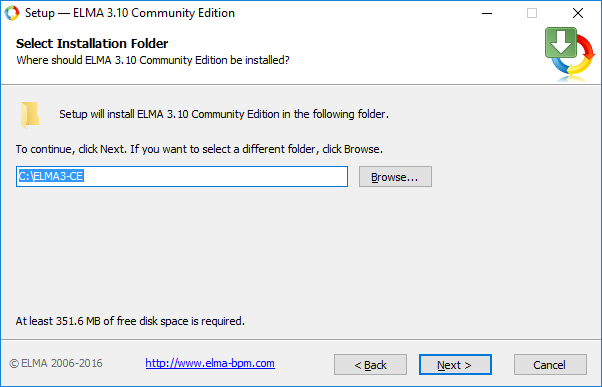 You can download Community Edition from ELMA website. 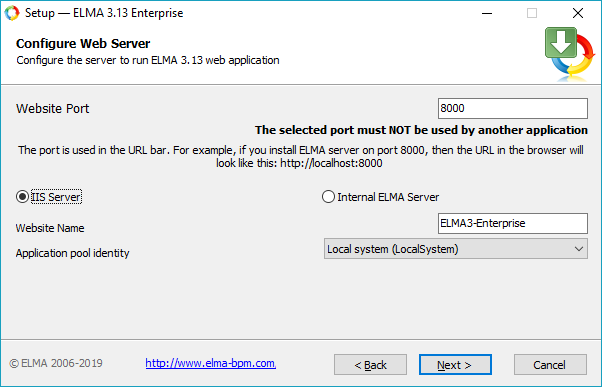 ELMA System requires .NET Framework 4 (or higher). It will be automatically installed during the system installation, if necessary. If the User Account Control dialog box appears, confirm that the action it displays is what you want. 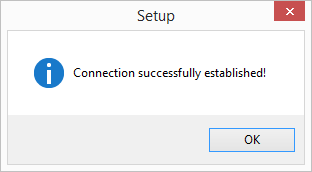 Click Yes to continue installation (fig. 1). Step 2. 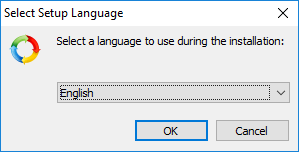 Select installer’s language. The dialog box asks you to Select your language. Choose your preferred language in the drop-down menu (Fig. 2). Click OK to continue. The start screen of the setup wizard (fig. 3) contains introductory information and some installation tips. Click Next to continue. 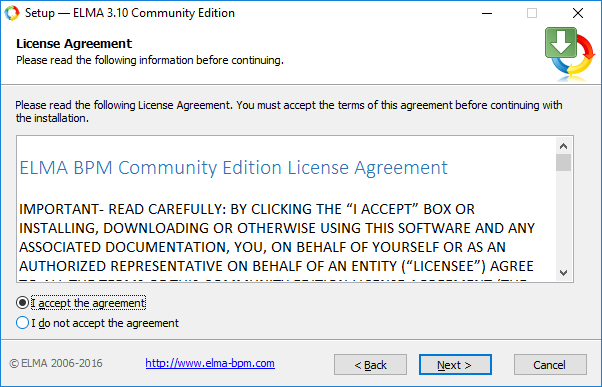 Please read the license agreement (Fig. 4). If you accept the terms and conditions, click I accept the agreement and then click Next. If you check I do not accept the agreement, the Next button will be unavailable (you will not be able to continue installation of the system). Step 5. Select the installation folder. 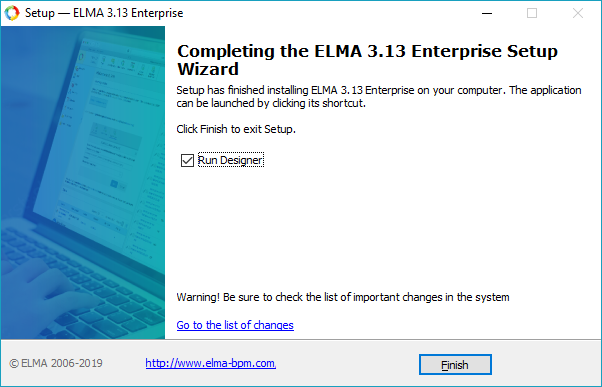 At this step of the wizard, choose the ELMA installation directory. It is recommended to use the default directory. To change the default directory click Browse and specify the new path. Click the Next button to continue. In the opened dialog box (Fig. 6), select the required configuration and click Next. 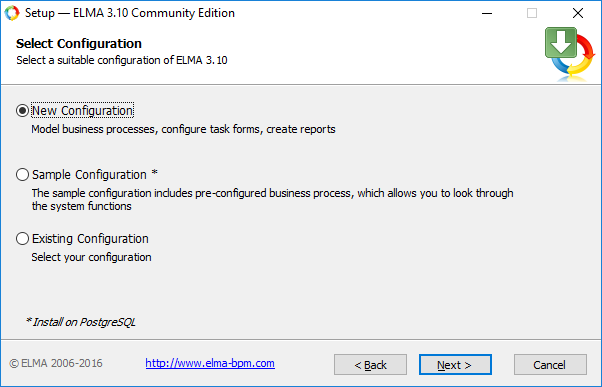 New Configuration – this configuration allows you to look through ELMA capabilities. It includes a ready-made organizational structure, business processes, users and so on. The sample configuration is operational. Create Configuration – create a new system configuration, where you have to create an organizational structure, users and business processes yourself. Existing Configuration – select the file with your existing configuration. Only Designer – install only ELMA Designer. Specify the location of the ELMA configuration files (Fig. 8). 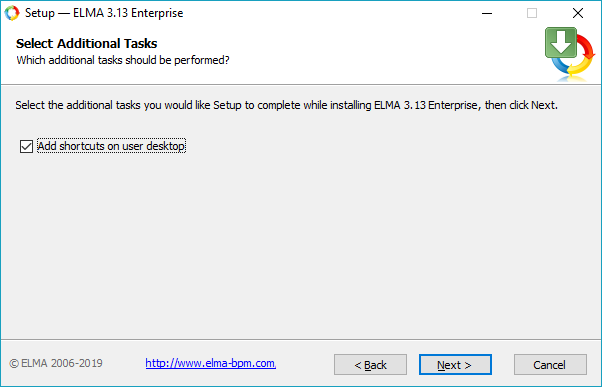 Click Browse and specify the path to the configuration folder that will contain ELMA configuration files. We recommend that you use the default UserConfig folder. Then specify the Database Server Type that you want to use. The following DBMS are available: Firebird, PostgreSQL and Microsoft SQL Server. Step 9. Configure a DBMS server. In this dialog box (fig. 12), you can configure settings for connecting to the PostgreSQL server. Install PostgreSQL it is necessary to configure the connection parameters to install the PostgreSQL server and click the Next button (fig. 12). Specify PostgreSQL server port — specify the port for connecting the ELMA server to the PostgreSQL server. By default, port 5433 is selected. This field is required. Specify the database name – enter the name of the ELMA system database to work with the PostgreSQL server to be installed. The specified database will be automatically created when you first start the ELMA server. This field is required. User Name – user account for accessing the PostgreSQL server. By default, this field contains the name of the PostgreSQL superuser – postgres. The value of this field cannot be changed manually. Password – if necessary, enter a password for the PostgreSQL superuser account. Use existing PostgreSQL — configure the connection settings for the previously installed PostgreSQL server and click the Next button (Fig. 13). 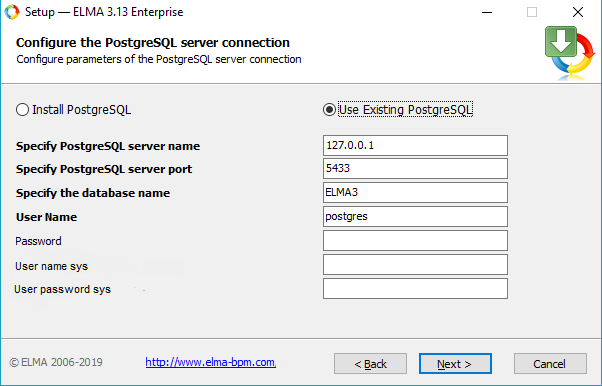 Specify PostgreSQL server name – in order to connect, specify the name of the PostgreSQL server on which the ELMA system databases will be stored. This field is required. 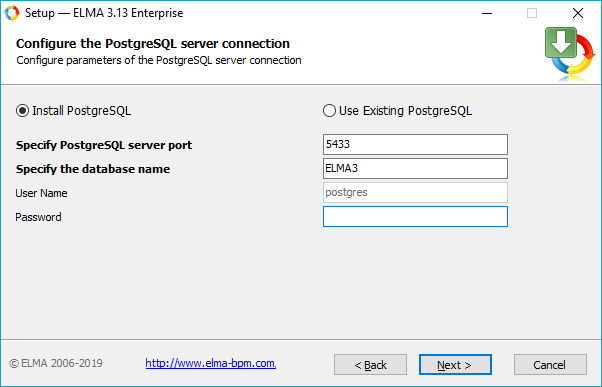 Specify PostgreSQL server port – in order to connect, specify the port for connecting the ELMA server to the PostgreSQL server. This field is required. Specify the database name – enter the database name of the specified PostgreSQL server to work with the ELMA system. The specified database will be automatically created when you first start the ELMA server. This field is required. User Name – user account to access the database. By default, this field contains the name of the PostgreSQL superuser – postgres. This field is required. Password – the password for the database user account. User name sys – PostgreSQL superuser account. User password sys – password for the PostgreSQL superuser account. Option 1. In this case, the PostgreSQL superuser manually creates a database and manually grants minimal access permissions to the database. Manually create an empty database. Connect the extension "uuid-ossp" to the database created earlier using the query create extension if not exists "uuid-ossp". clean – the database name, elma – username. In the User name and Password fields we enter the user account and password with minimal permissions to the database. Option 2. In this case, the system creates a database that is not yet in the DBMS, and grants minimal access permissions to this database. In the User name sys и User password sys fields, enter the PostgreSQL superuser account and password. In the User Name and Password fields, enter the user account and password, for which the system will later grant minimal access permissions to the database. For security reasons, the User name sys and sys User password sys fields can be deleted from the configuration file ../<Folder with the files of the ELMA system>/UserConfig/Configuration.config after starting the server. 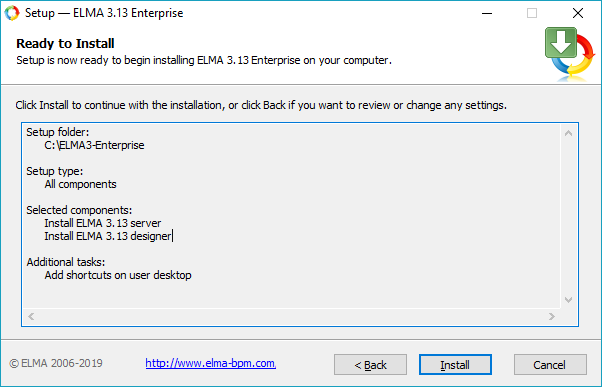 ELMA system works correctly only if PostgreSQL server of version 9.5 or higher is installed. In this dialog box (fig. 14), you can configure settings for connecting to the Firebird server. Install Firebird – configure the connection settings for installing the Firebird server and click Next. In the Select Firebird server port field, select the port for connecting the ELMA server to the Firebird server (fig. 14). We recommend that you use the default port – 3056. This field is required. 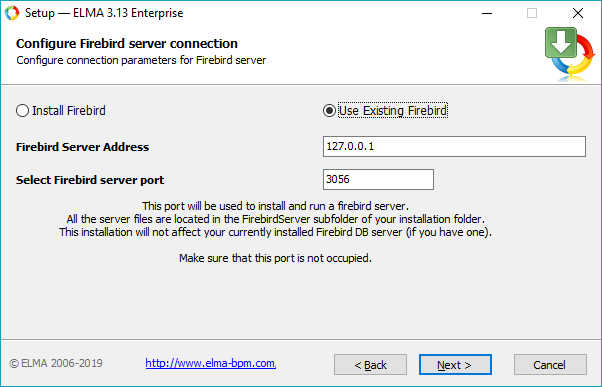 Use Existing Firebird – configure the connection settings for the previously installed Firebird server and click the Next button (fig. 15). Firebird Server Address – specify the address of the Firebird server where the ELMA system databases will be stored. It is recommended to use the value 127.0.0.1. This field is required. 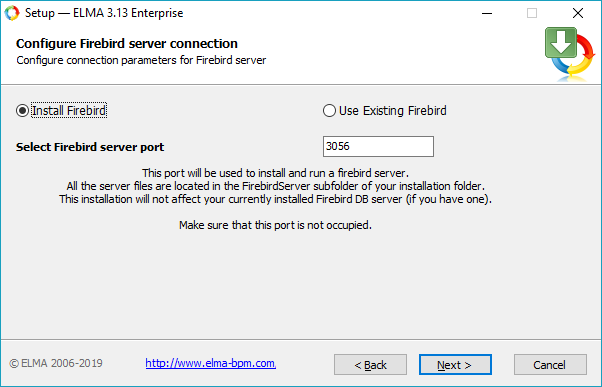 Select Firebird server port – specify the port for the ELMA server to connect to the Firebird server. It is recommended to use the default port – 3056. This field is required. In this dialog box (fig. 16), fill in the required fields and click Next to continue the installation. Select MSSQL server host name – enter or select from the dropdown list the MSSQL host name, on which the ELMA databases will be stored. 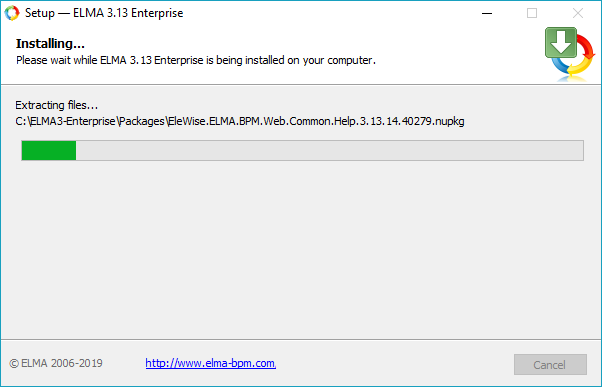 By default, this field's value is (local) – that is the local MSSQL server, located on the computer, on which ELMA is being installed. This field is required. Select database name – enter or select from the dropdown list the database of the MSSQL server for working with ELMA. If you select a non-existing database, it will be created automatically. This field is required. Use Windows Authentication – checking this box enables automatic authentication in the system, in case of successful authentication in the corporate domain. 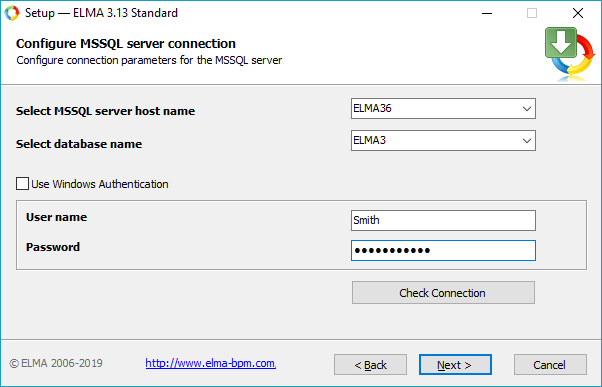 The access to the MS SQL Server will be granted to the user, who started the ELMA web server. If the box is not checked, you have to enter data of the user account, which will access the MS SQL Server. This user must have administrator permissions for the MS SQL Server. When you click the Check MSSQL server connection, the program will attempt to connect to the MSSQL server, selected in the Select MSSQL server host name field. Then you will see a dialog box, with the information on the connection check result (fig. 14). In this dialog box (fig. 18), in Oracle server connection string, specify the address of the Oracle server, as well as the user account information on behalf of which the server will be accessed. This field is required. Enlist=false – forbid opening multiple transactions. User name sys – Oracle superuser account. User password sys – password for the Oracle superuser account. Option 1. In this case, the Oracle superuser manually creates a database and manually grants minimal access permissions to the database. In the Oracle server connection field, enter the user account and password with minimum access permissions to the database. Option 2. In this case, the system creates a database that is not yet in the DBMS, and grants minimum access permissions to this database. 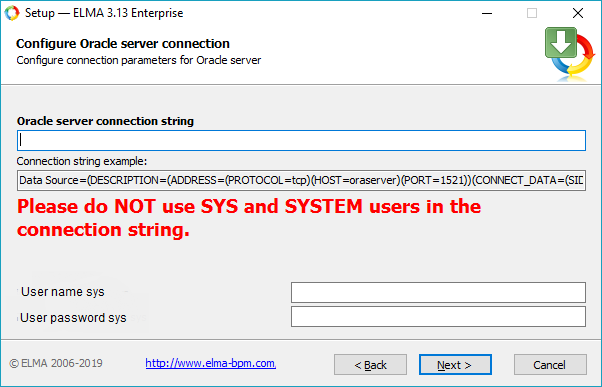 In the Oracle server connection string field, enter the account and the user password for which the system will later grant the minimum access permissions to the database. 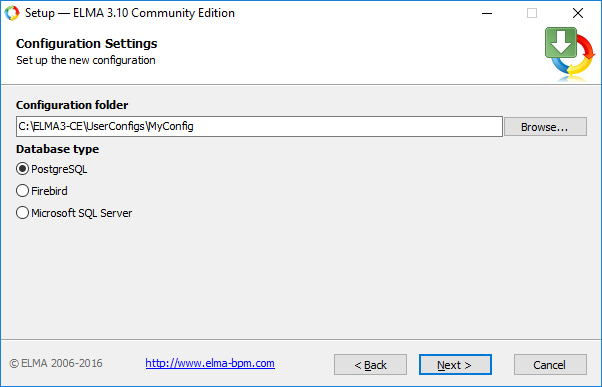 To ensure security, you can delete the User name sys and User password sys from the configuration file ../<Folder with the files of the ELMA system>/UserConfig/Configuration when the server is started. Step 10. Configure the Web Server. In the opened dialog box (fig. 19) enter the required parameters and click Next. 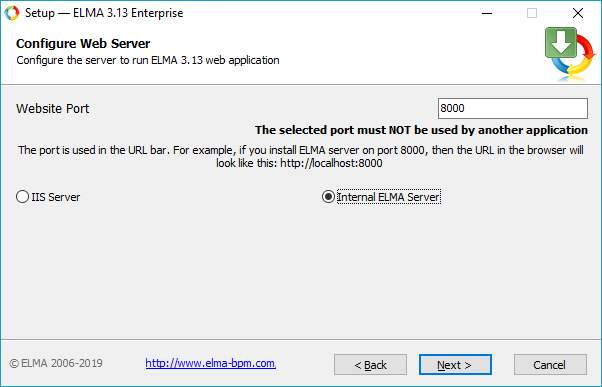 Web site port – port number for establishing the connection with ELMA web server. Port 8000 is used by default. If the port is used by another application, the system will show a respective notification. In this case, change the port. Next, you need to specify the type of web server of the system – IIS Server or Internal ELMA server (Cassini web server). The type of web server is selected by setting the switch to the desired position. If IIS is not available on the current operating system, the IIS server switch will be unavailable. If the switch is set to the IIS Server position, additional fields will be displayed in this dialog box (Fig. 20). Website Name — the name of the ELMA web server in IIS. System (LocalSystem) - an account with local administrator access permissions that belongs to the Administrators group on the web server. This account is selected by default. We recommend using this account. Service (LocalService) - an account with the minimum set of access permissions required to run IIS server web applications. We do not recommend using this account. Network service (NetworkService) - an account with the minimum set of access permissions required to run IIS server web applications. We do not recommend using this account. Application Pool (ApplicationPoolIdentity) - The application pool identity account that is created dynamically when the application pool is started. We do not recommend using this account. User - a specific user account. When this item is selected, the additional required Username and Password fields will be displayed in the dialog box. 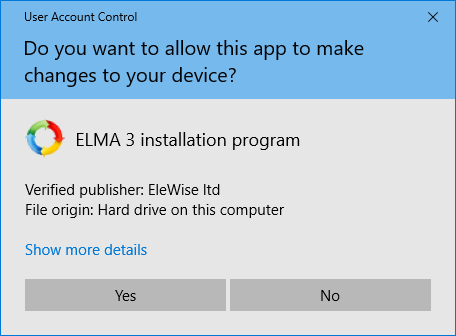 We recommend using this account and choosing a Windows user with administrator permissions on the computer on which the ELMA system is being installed. To continue the installation, click the Next button. If you need to add shortcuts to the desktop, check the Add links on user desktop box in the opened dialog box (fig. 21). To continue installation, click Next. At this step (fig. 22) you can see the full list of parameters, selected at the previous steps. You can change these parameters, if necessary. To do so, you need to return to the required step by clicking Back. ELMA files are copied to the computer (fig. 23). This process may take a few minutes, please, wait until it is complete. The dialog box displays the information on the system installation results. 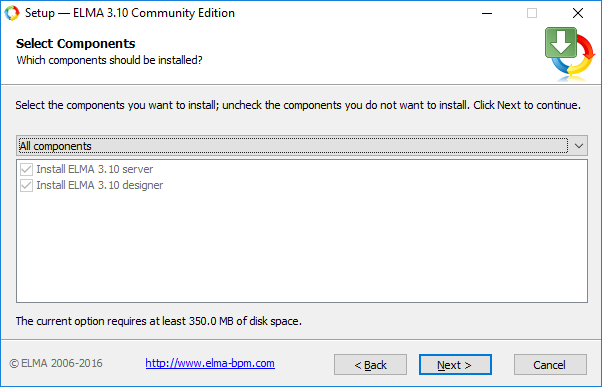 To start ELMA Designer after the installation is complete, check the Run designer box (fig. 24). 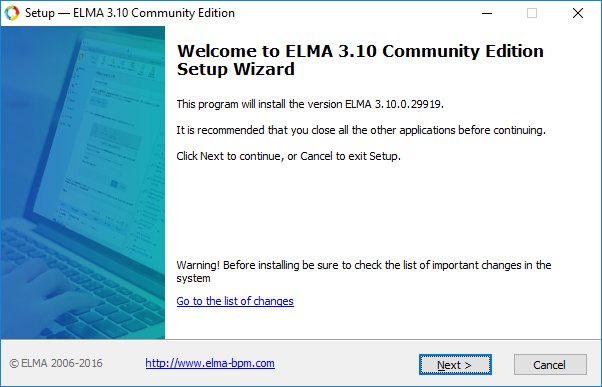 To check if the ELMA server has been installed correctly, open the web browser on the server and open the page: http://localhost:8000 (if you selected a different port for the ELMA web server, use it). After a while (the first launch takes a long time) the system will display a page for entering the activation key. In this case, the system is installed correctly. What version of the .NET Framework is specified for the application pool: use v4.0. Which user is specified in the application pool identity. To do this, right-click on the name of the application pool in the list, open the context menu, select "Additional parameters", go to the "Process Model" section. The "Identity" field should contain the value "LocalSystem" or a real system account.